The list of Sunday walks to September 2019 is now available. Please note that some walks are to be confirmed (TBC) depending on leader availability. The meeting point for Sunday walks is the car park outside Maxi Zoo in the Retail Park/Market Green in Midleton. The list of low-level walks on Saturdays up to September 2019 is now available. Please note that unless stated otherwise, the meeting point for Saturday walks is the car park outside Maxi Zoo in the Retail Park/Market Green in Midleton. The list of Wednesday evening walks to September 2019 is now available. Please note that all meeting points for walks in Midleton will now be the car park area across from Maxi Zoo in Midleton. DO NOT go to the Distillery Lane car park anymore. The new 2018/2019 club membership form can be downloaded here or from the downloads page. Please can walkers arrive at each meeting point 10 minutes prior to the advertised times to allow sign in with the walk leader and a prompt start. The club committee is listed on the Contact us page. Membership, disclaimer, incident report and other forms are now available as .PDF or .DOC files from the Downloads page. Walk lists for Sunday walks and Saturday low-level walks are also available as .PDF files. Only registered members should participate on A/B walks. For beginners or inexperienced hillwalkers, the club recommends they commence with C walks. Please see the club rules page. It's very important that proper gear is used for hillwalking; strong boots, waterproof jacket, packed lunch, bottle of water, change of clothing, hat and gloves for winter walking. No jeans or trainers. Please see the equipment page. To cut down on travel expenses, members mostly car-pool from the main meeting point at the Car Park outside Maxi Zoo in Midleton. The normal practice is €5 per passenger for short journeys (up to 50 miles) and €10 for medium journeys (50 miles +). This applies to A/B/C walks. Please note all members participate on club walks at their own risk. The club always welcomes new members! Visit our New members page for more information. 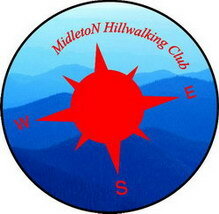 The Midleton Hillwalking Club was formed in March 2005 and was the first hillwalking club in the greater East Cork area. The club provides Mountain walks, Hill walks, Trail walks and Low level local walks. Every second Sunday we trek on the mountains of South Munster. On alternate Saturday afternoons we walk locally in the East Cork Region. These walks vary from cliff walks, track walks, forest walks and riverside walks. Following local advertising the club received a huge response. Initially it was intended to provide mountain and hill walks only, but a considerable number of members were interested in low level walks. Members come from Cork City, Glanmire and all over East Cork. The club has a wide range of walks for its members. The club is very fortunate to have large number of club leaders. Many have several years experience with other clubs, but now reside in the East Cork area. Our leaders play a huge role in the operation of the club. Their skills and experience are vital and are highly respected by all the members. Club rules and procedures must be followed to ensure the safety and welfare of our walkers while participating. All members must adhere to the guidelines and instructions set out by the leaders at all times. Since the formation of our club with the cooperation and involvement of its members, it really has been most successful. The club is affiliated to Mountaineering Ireland (formerly the Mountaineering Council of Ireland).